2. Begin the sauce by melting 2 tablespoons butter in a medium saucepan over medium high temperature, then add the shallots and cook until translucent. 3. Add the pepper, nutmeg, and vinegar and bring to a boil, then add the maple syrup and return to a boil; allow to reduce by half and reserve. 4. While sauce is reducing, begin working on the chicken by spatchcocking it: with sharp kitchen or poultry shears, cut the backbone out of the chicken by cutting along one side of the backbone, then along the other; turn the chicken over and remove the keel bone, then press down to flatten it; additionally, for this recipe you also remove the wings; do NOT remove the skin of the chicken. 5. Season both sides of prepared chicken with salt and freshly ground black pepper. 6. Heat the oil or fat in a large, heavy oven-proof skillet over high temperature; when it is very hot, carefully add the chicken skin-side-down into the hot pan (place the chicken away from you, not toward, to avoid oil splatters). 7. Cook over high temperature for approximately 10 minutes, checking to see that the skin is turning a nice, crispy golden brown. 8. Turn the chicken over in the skillet, then place the entire pan in the pre-heated oven and continue to roast, basting often, until done and juices run clear, about 35-45 minutes. 9. When chicken is done, remove it from the oven and the pan and allow it to rest for about 10 minutes. 10. While the chicken rests, begin the topping by combining the melted butter and almonds in a small skillet, and sauté until the nuts turn golden brown. 11. Add the leeks and cranberries and cook until leeks begin to go limp, about 5 – 7 minutes, then add the bread crumbs and salt and pepper to taste and sauté for 3 minutes until crumbs begin to brown; remove and place in serving dish. 12. Finish the sauce by removing the fat from the skillet the chicken was cooked in, then deglaze it with the sauce; pour completed sauce into a serving bowl. 13. 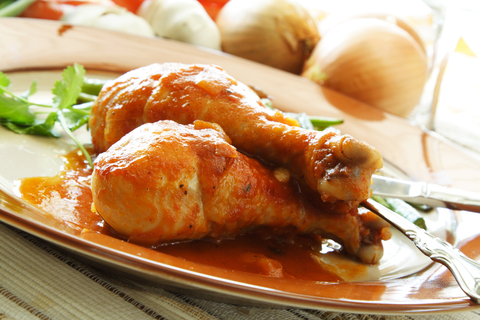 To serve: cut the chicken into serving size pieces, top with the sauce and then with the topping.